Covers the water of Lake Crowley. 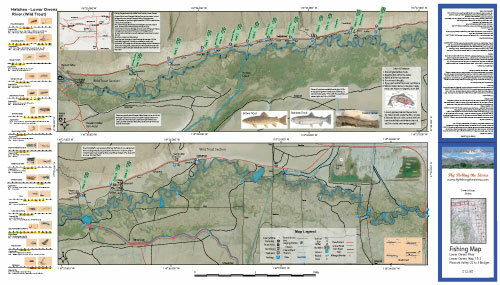 Shows lake topographry, GPS Long./Lat., camping areas, road access, and below-surface stream channels. 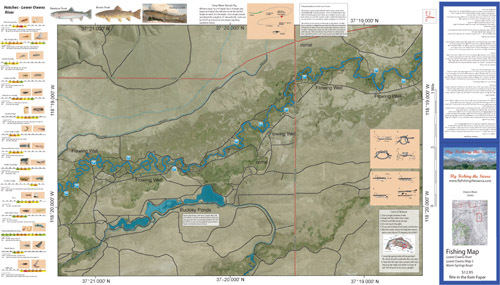 Special Features are Suggested Flies, Midging Rigs, Streamer Tactics, Fishing Season and Regulations, Fish Identification, Where to Fish, Catch & Release Procedures, and Stream Etiquette guidelines. Printed on Rite-in-the-Rain Paper that will allow you to write those special notes. Waterproof and Durable. Covers the Owens River between the mouth of Crowley Lake to Benton Crossing Bridge. Satellite photo background depicts vegetation surrounding the river. Shows camping areas, GPS Long./Lat., road access, trails, and fences. Access through the Stream Fence are shown. Special Features are the Hatch Chart, Fishing Season and Regulations, Fish Identification, Catch & Release Procedures, Nymphing Rigs, Knots, and Stream Etiquette guidelines. Printed on Rite-in-the-Rain Paper that will allow you to write those special notes. Waterproof and Durable. 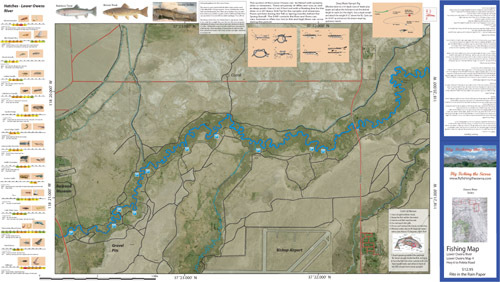 Covers the Owens River between the Benton Crossing Bridge to 1/2 mile below Long Ears.Satellite photo background depicts vegetation surrounding the river. Shows camping areas, GPS Long./Lat., road access, trails, and fences. Access through the Stream Fence are shown. 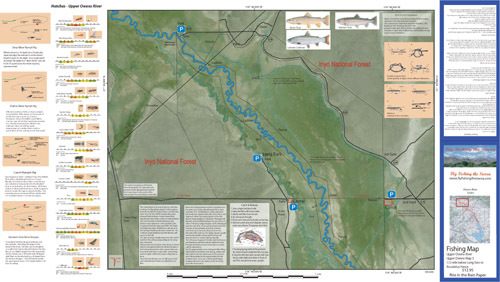 Special Features are the Hatch Chart, Fishing Season and Regulations, Fish Identification, Catch & Release Procedures, Nymphing Rigs, Knots, and Stream Etiquette guidelines. Printed on Rite-in-the-Rain Paper that will allow you to write those special notes. Waterproof and Durable. 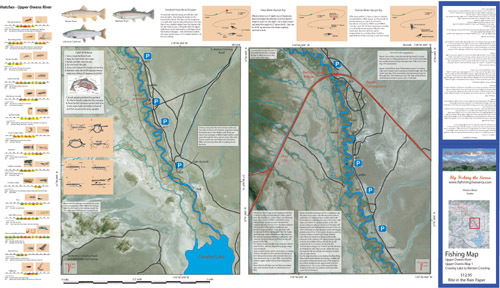 Covers the Owens River between 1/2 mile below Long Ears to the Arcularius Fence. Satellite photo background depicts vegetation surrounding the river. Shows GPS Long./Lat., road access, trails, and fences. Access through the Stream Fence are shown. 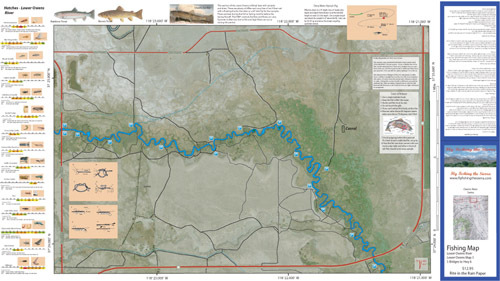 Special Features are the Hatch Chart, Fishing Season and Regulations, Fish Identification, Catch & Release Procedures, Nymphing Rigs, Knots, and Stream Etiquette guidelines. Printed on Rite-in-the-Rain Paper that will allow you to write those special notes. Waterproof and Durable. Covers the Owens River between Long Valley Dam (Lake Crowley) to the Middle Gorge Power Plant.Shows road access, GPS Long./Lat.and trails. Special Features are the Hatch Chart, Fishing Season and Regulations, Fish Identification, Catch & Release Procedures, Nymphing Rigs, and Stream Etiquette guidelines. Printed on Rite-in-the-Rain Paper that will allow you to write those special notes. Waterproof and Durable. Covers the Owens River between the Middle Gorge Power Plant to the Pleasant Valley Reservoir.Shows road access, GPS Long./Lat.and trails. Special Features are the Hatch Chart, Fishing Season and Regulations, Fish Identification, Nymphing Rigs, and Stream Etiquette guidelines. Printed on Rite-in-the-Rain Paper that will allow you to write those special notes. Waterproof and Durable. Covers the Owens River between the Pleasant Valley Reservoir and 5 Bridges.Shows road access, GPS Long./Lat.and trails. Satellite photo background depicts vegetation surrounding the river. 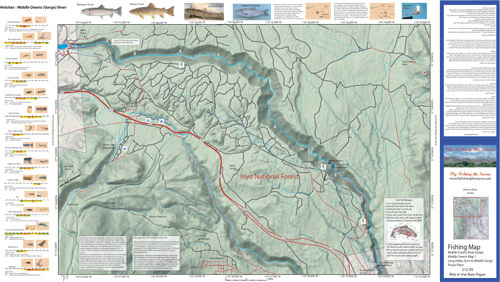 Special Features are the Hatch Chart, Fishing Season and Regulations, Fish Identification, Catch & Release Procedures, and Stream Etiquette guidelines. Printed on Rite-in-the-Rain Paper that will allow you to write those special notes. Waterproof and Durable. Covers the Owens River between 5 Bridges Road and Hwy 6.Shows road access, GPS Long./Lat.and trails. Satellite photo background depicts vegetation surrounding the river. 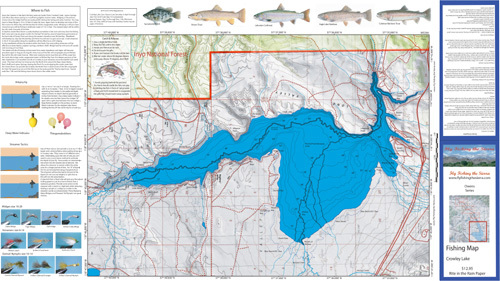 Special Features are the Hatch Chart, Fishing Season and Regulations, Fish Identification, Catch & Release Procedures, and Stream Etiquette guidelines. Printed on Rite-in-the-Rain Paper that will allow you to write those special notes. Waterproof and Durable. Covers the Owens River between Hwy 6 and Poleta Road.Shows road access, GPS Long./Lat.and trails. Satellite photo background depicts vegetation surrounding the river. 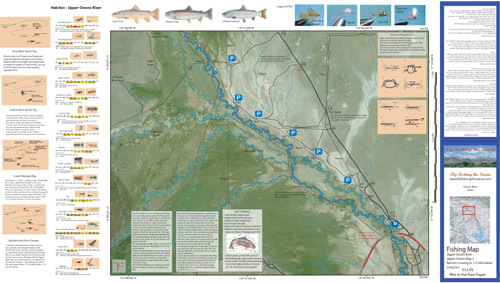 Special Features are the Hatch Chart, Fishing Season and Regulations, Fish Identification, Catch & Release Procedures, and Stream Etiquette guidelines. Printed on Rite-in-the-Rain Paper that will allow you to write those special notes. Waterproof and Durable. Covers the Owens River off the Warm Springs Road access.Shows road access, GPS Long./Lat.and trails. Satellite photo background depicts vegetation surrounding the river. Special Features are the Hatch Chart, Fishing Season and Regulations, Fish Identification, Catch & Release Procedures, and Stream Etiquette guidelines. Printed on Rite-in-the-Rain Paper that will allow you to write those special notes. Waterproof and Durable. 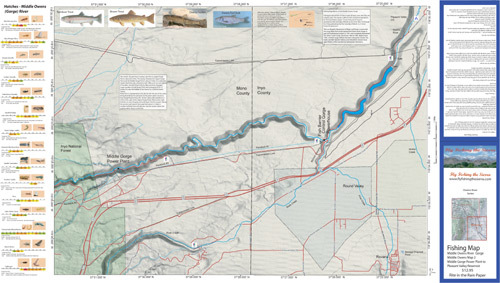 Covers the Owens River off the Collins Road access.Shows road access, GPS Long./Lat.and trails. Satellite photo background depicts vegetation surrounding the river. Special Features are the Hatch Chart, Fishing Season and Regulations, Fish Identification, Catch & Release Procedures, and Stream Etiquette guidelines. Printed on Rite-in-the-Rain Paper that will allow you to write those special notes. Waterproof and Durable. 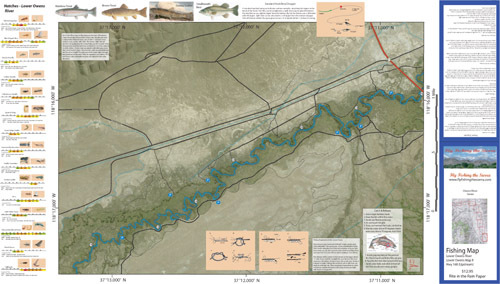 Covers the Owens River, 4 miles upstream of the Owens Valley Radio Observatory (Cal Tech) and 1 mile downstream.Shows road access, GPS Long./Lat.and trails. Satellite photo background depicts vegetation surrounding the river. 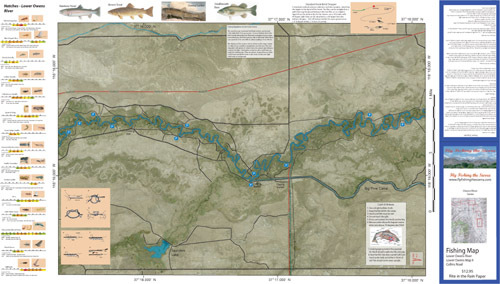 Special Features are the Hatch Chart, Fishing Season and Regulations, Fish Identification, Catch & Release Procedures, and Stream Etiquette guidelines. Printed on Rite-in-the-Rain Paper that will allow you to write those special notes. Waterproof and Durable. 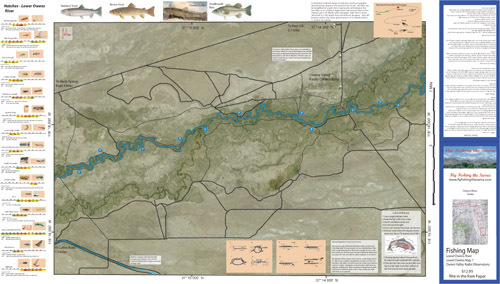 Covers the Owens River, 6 miles upstream of the Hwy 168.Shows road access, GPS Long./Lat.and trails. Satellite photo background depicts vegetation surrounding the river. Suggested Parking Sites and Stream Mileage from the Put-in/Take out at Hwy 168. Special Features are the Hatch Chart, Fishing Season and Regulations, Fish Identification, Catch & Release Procedures, and Stream Etiquette guidelines. Printed on Rite-in-the-Rain Paper that will allow you to write those special notes. Waterproof and Durable.